Breaking ground for the Health Science Center. 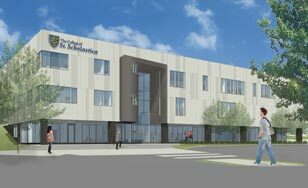 Construction is officially underway on the College's first-ever off-campus academic building in Duluth, a 45,000 sq. ft. facility that will usher in a new era of health care education for St. Scholastica as well as services for the community. St. Scholastica's Health Science Center, slated to be completed by fall 2016, is located on a three-acre site in the BlueStone development at 940 Woodland Ave., about a mile from the main St. Scholastica campus. The building will house classrooms and laboratories for the new Physician Assistant program and expanded Occupational Therapy and Physical Therapy programs. It will open for classes in fall 2016. "We explored several options to accommodate our growth in graduate health science programs," said President Larry Goodwin. "We have outgrown our main campus, and the new Health Science Center will open up space in our existing Science Building to expand our Nursing programs and other academic programs." The facility will also feature an interdisciplinary clinic that will integrate classroom teaching and experiential learning. Named maurices Community Clinic, it will offer students the opportunity to receive supervised hands-on experience working with adults and children who may not be eligible for services, are uninsured or are underinsured. maurices provided a major multi-year lead gift for the maurices Community Clinic. Ron Berkeland, Dean of the School of Health Sciences at St. Scholastica, was involved in developing the academic facilities in the Health Science Center. "This beautiful new space will include bona fide rehabilitation and exam clinics, allowing us to increase this component of the curricula and offer more services to the community," he said. "The opportunities for education, clinical services and research are greatly expanded." The facility will cost $17.1 million including the cost of the land. The architect is HGA Architecture, Engineering and Planning of Minneapolis. The contractor is McGough Construction Co. of St. Paul. The College of St. Scholastica owns the land; the Health Sciences Education Facility Corporation, a Minnesota nonprofit 501(c) (3), will own the building and lease it to St. Scholastica. 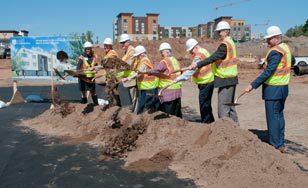 A groundbreaking ceremony was held on Aug. 26 to commemorate the start of construction. Local media have picked up on this news story. Here are links to local news coverage in the Duluth News Tribune, WDIO, Fox 21 and KBJR. Stay up-to-date on the construction of the Health Science Center.